NEW YORK, New York — It was a farewell ceremony, organized by Armenia Fund USA in honor of Khoren Bandazian’s special friend - His Excellency Ambassador Garen Nazarian, the permanent representative of the Republic of Armenia to the United Nations. Yet to the delight of many guests and dignitaries in attendance, the esteemed guest of honor turned the tables by taking a few moments to graciously present Mr. Bandazian with the prestigious Republic of Armenia Presidential Award. Khoren Bandazian has been an impressive figure in the Armenian-American community for many years. After eight distinguished years of dedicated service as the secretary of the board of directors of Armenia Fund USA, Khoren assumed the chairmanship. To this position, Mr. Bandazian brought a wealth of executive experience gained in his professional life as well as many other Armenian organizations and causes with which has associated himself since his youth. He had served on various committees organized by the Armenian Diocese and the Armenian Prelacy, such as the 1700th Anniversary of Christianity in Armenia committee, to name but a few. He also served on the board of St. Vartanantz Armenian Apostolic Church of Ridgefield, NJ. 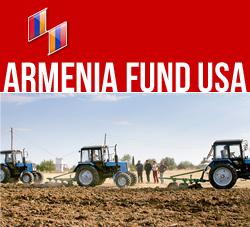 In 2007, Khoren chaired Armenia Fund USA’s fifteenth anniversary gala at the United Nations, to raise much needed funds in support of the organization’s efforts. On a parallel track, Khoren has built a highly successful career as a real estate attorney. He recently rejoined the firm of Winne, Banta, Hetherington, Basralian & Kahn in New Jersey as a Principal in its Real Estate and Corporate and Business Services Practices. April has been an auspicious month for Mr. Bandazian as he continues to serve as board chairman of Armenia Fund USA and as chairman of Eastern Region Armenian Genocide Centennial Committee. By all accounts, he possesses the drive, capability and organization skills to manage both of these important endeavors.